Not that I want to jump into a controversy or anything. But a whole lot of media time has been spent dissecting Amy Chua's memoir, Battle Hymn of the Tiger Mother. If you by any chance have not heard of it or her, the journalist mom is/was very strict and borderline mean. And because she is/was very strict, her daughters are aiming to be fabulously successful. They play the piano incredibly well for goodness sake. Weldon did play the violin in grade school and middle school, that is until I switched from renting to the purchase of one such requested $300 violin. He decided then to quit and bought a guitar for himself, the one he left under his bed for 10 years. I sold the violin to a friend. Brendan played the trombone quite briefly, likely because I asked him to practice outside. Colin played the saxophone, until he got exceptionally nervous before his first recital in fourth grade and became ill in and around said rented saxophone. I cleaned it of course before I returned it to the rental place. I could never afford a piano in the house. So no matter how much this best-selling author mother swears by her demanding, yelling, screaming, pushing and otherwise engaging in strict Chinese parenting, this is not how it goes-- and has gone in my house. And that is not likely just because I am not Chinese, but Irish and German, though the chicken egg foo young I absolutely adore from New Star is my second favorite food of all time. And to torture me as the youngest of six in seven years, my brothers told me I was adopted and sent to our house in a crate from China and I could not tell mom or dad I knew the secret. I didn't say it was politically correct. OK, right, egg foo young is second, spinach dip is first. I did eventually figure out there was no crate involved in my arrival at our home. I have been called very strict, but the boys now 22, 20 and 17, have participated in sleepovers since they were 6, and even if I do shout directives at them quite often, not much happens as a result. I am just not intimidating. My boys have been taller than me for years. All the boys are 5' 10" or taller, and I have not grown since college, stopping at 5'6. They are respectful, sure, but selectively. Sometimes if I get mad, real mad, they laugh. No one is scared of me at my address. That is not to say that I err on the side of gentleness. I am no pushover. Just ask Brendan about the speeding tickets. I am not a Tiger Mom, I am a Huskies Mom. The Siberian Husky is the mascot for the wrestling team at Oak Park-River Forest High School and as you may have noticed from this site, I spend a lot of time cheering my sons in wrestling tournaments. And let me say unequivocably, it is wrestling that has helped me be a better parent. 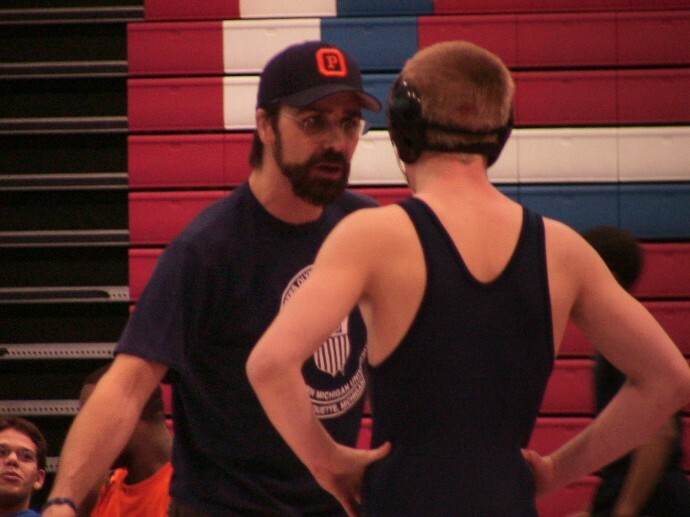 It is wrestling, and quite specifically, Coach Mike Powell, who has helped shape my sons. Coach Powell has taught them lessons far beyond the mat. He has taught Weldon, Brendan and Colin about physical and mental discipline, respect, the need for good health, nutrition, accountablity and integrity. It is not that I have ignored these subjects at my house, it is that a lot of times, my sons ignore the lessons when they come from me. They just do. It takes a big parent to admit that her reach is limited. It takes a realistic mother to understand that it is not optimal to have your influence over your child be so enormous that it shapes everything the child does or hopes to become. That is why your children grow up to write memoirs. I do my best. I strongly suggest. I mandate. I insist. But I do not believe parenting is meant to be a battle. And the battle hymn we sing as parents should be a song that is inspirational, uplifting and not just noise in the background. Our children hear a lot of songs and we can't possibly be the only voice in their heads. I don't want to be. I am grateful for the chorus of influence. We just hope and pray they can at least hum our tunes when asked. The boys are not yet fully out in the world on their own. Weldon is close. Brendan has two more years of college and Colin is a junior in high school. So the jury is out on what kind of job I did as a mother. Perhaps Amy Chua is laughing at the rest of us whose children are less than 4.0 students without the accolades, scholarships and awards her daughters have won. Weldon has won his share, but like I said, no one can play the piano. I do have something in common with her. I have spent a whole lot of time yelling. But outside of the curfew and laundry reminders, mostly mine was in the stands. Screaming their names as loud as I could watching each one of them wrestle. And I am as proud of that as a Huskies Mom as any Tiger Mother could ever hope to be. This is so awesome. As someone who’s parents are still waiting to see if their work has been a success I can say that Ms. Chau’s children may have more accolades and a higher GPA than me, though a would say its impossible to have a higher GPA than me, I would be willing to bet that they are not as good of people as me. I would bet I have more friends than them, my friends feel a stronger connection to me then her kid’s friends to them, and I know how to push myself further than her kids can. And I would bet the same is true for Weldon, Brendan and Colin. My parents rarely yelled at me bet there were times when they needed to tell me what to do and they did. Life is more than just awards and grades and a good parent should want more than just awards and grades for their children.